When the salmon hatch, do not feed them, since they have an egg sac that provides nourishment. Adding food will increase the amount of ammonia, which will reduce the chances the salmon will survive. When they start feeding, give the fish only as much food as they will eat in a minute. The refrigeration bar may develop ice. Get rid of the ice by raising the temperature, but do not let it exceed 50 degrees Fahrenheit. Placing salmon eggs in a tank can protect them from diseases and parasites, which make the adult salmon safer for human consumption. The waste produced by the salmon can be treated. Also, fewer chemicals are needed to raise salmon in tanks than in aqua farms. The main challenge for raising salmon is to keep the temperature of the aquarium at a level suitable for them, which is easy if you have a refrigeration unit and a device that can monitor and control the tank temperatures. The tank should be rinsed with water before the adding the salmon eggs. Clean out the front of the tank only, for visibility. Algae will develop in the tank, but they are beneficial. Install an aerator to ensure the tank has enough oxygen. Filter the water so it does not develop too much ammonia, which can overwhelm and kill the fish. Keep the temperatures for the salmon lower than with most tanks. The tank should be hooked up to a refrigerator so the water can continually circulate through and cool down. The temperature should remain at 45 degrees Fahrenheit. Consider installing a thermostat if you’re worried about maintaining the temperature. Test out all the equipment four weeks before you get the salmon eggs, to make sure that everything works. Cover the tank with Styrofoam to keep light out and maintain the temperature, since heat passes out of glass. This will create an ideal environment for the eggs to incubate. The water should be at the right temperature, since water that is too hot will cause the salmon to hatch too early and water that is too cold will make them not hatch at all. Place the eggs in fresh, natural gravel you rinse in cool water to remove the dust. When the eggs stop hatching, remove the Styrofoam. Wait until the fish have consumed their egg sacs before feeding. Start feeding the fish by dropping food into the tank and letting the fish catch it before it hits the ground. The fish will “button up,” a term referring to when they have consumed their egg sac. The egg hatchery should have food designed for young salmon. Start adding frozen bloodworms to the salmon about eight weeks after they hatch. These bloodworms provide protein to the fish. However, make sure the ammonia levels are low before adding the bloodworms, since they can contribute to ammonia levels. The ammonia levels shouldn't be above 0.25 parts per million. Ideally, they should be at zero. Salmon in tanks with too much ammonia will have red streaks on their gills. Check the water temperature daily. 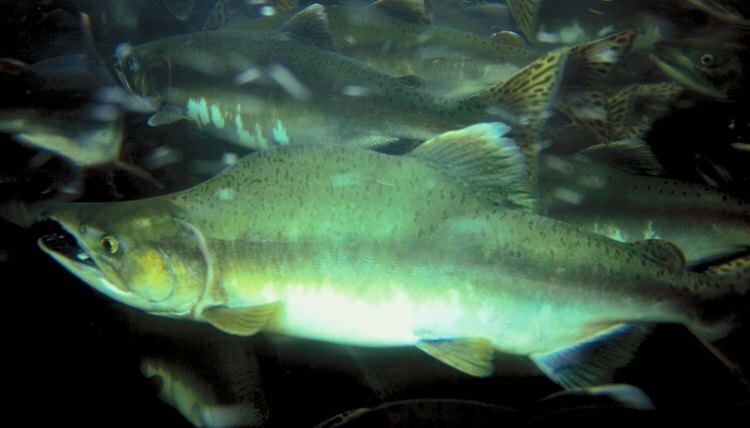 Temperatures above 50 degrees Fahrenheit can easily kill the salmon. Remove white or yellowish eggs, which are dead. Chuck Robert specializes in nutrition, marketing, nonprofit organizations and travel. He has been writing since 2007, serving as a ghostwriter and contributing to online publications. Robert holds a Master of Arts with a dual specialization in literature and composition from Purdue University.